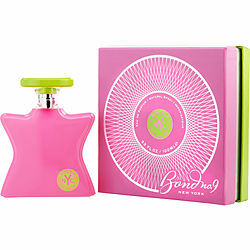 Freshen up your days with Bond No. 9 Madison Square Park for women, which captures the essence of a garden in full bloom. Created by Bond No. 9, this earthy, floral scent combines green notes of grass with flowery notes of hyacinth, rose and pink tulip as well as the sweet, fruity notes of blueberry. Introduced in 2011, this scent allows you to take the outdoors along with you to the office, as it works all day to envelop you in the essence of nature. I love this scent because it last all day. Bought Bond no. 9 Madison square Park for my wife she loves it. Last 6 to 10 hours. Bond No. 9 Madison Square Park is a lovely fragrance....it will make you fall in love with yourself! Madison Square Garden is amazing. The smell is just a head turner if I must say! I had to buy two extra bottles because my mother and sister love it so much!